I thought it would be interesting to share some of the nifty little things I come across on occasion that might not be well known, and some might even make great gifts this holiday season! The first installment is for a gift I received earlier this year - Rocketbook (https://getrocketbook.com/). Essdentially this is a traditional notebook with a twist. Using the companion app, you can scan the pages you’ve written and then have them sent to a variety of digital places - email, cloud, etc. Then, given that you are using erasable ink on their special paper, you can wet the included microfiber cloth and erase the page and use it again - so really, one small notebook is all you need for handwritten notes. Now, for me this is a nifty gadget in search of a use, as I’m all in on the digital side using the iPad and Pencil for note taking, but I do know many people like the physicality of writing, and although this does feel slightly different than traditional paper and pen/pencil, it’s a great way to bridge that gap into the digital offering you a good way to store your creative writing or drawing and share it easily with others. You can program several symobols at the bottom of the page to automatically do something with the page, so basically, checking the symbol at the bottom will take that action when you scan the page with the app, making the process pretty seamless if you routinely want to share to a specific service or person. Perhaps a neat way to send handwritten thank you notes this holiday season? The headphone jack has been a hot topic in the last couple years, and I, like many, were quite perturbed when my new iPhone 7 had no headphone jack. Sure, I had some Bluetooth headphones, but I had those iconic white ear buds in every bag, nook, and cranny around. Of course, no matter how hard I tried, they always ended up in a tangled mess that often took more effort to untangle than was ever worth. Perhaps my biggest point of contention with the headphone jack was my car, literally one model year before USB was pretty much standard, I still had the Aux Input, and since the CD player had died in my life so far before, I had a nifty phone holder that made use of the CD slot in the dash, keeping the iPhone at the perfect location for maps and safe access when necessary. Now I had to get a new concoction of dongles so that I could both charge and hear the output of my phone, as buying a new car isn’t in my near future. 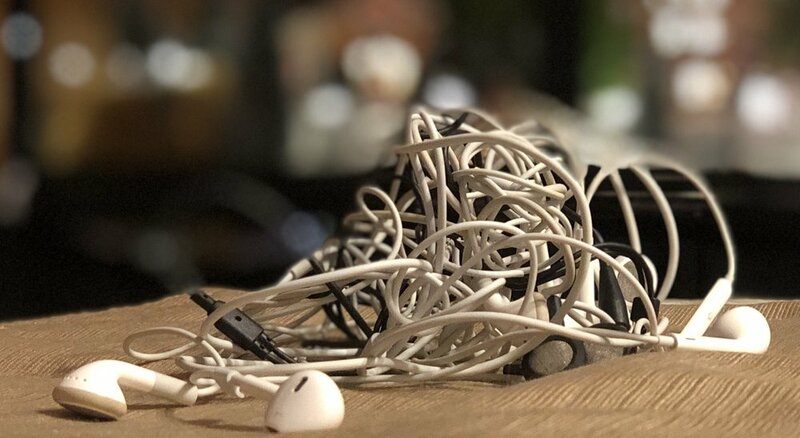 Fast forward to the iPhone X and AirPods, and I had completely forgotten about wired headphones. The AirPods switch seamlessly (well, most of the time) between my phone, iPad, AppleTV, MacPro, and MacBook. They sound great to me, are possibly useful during teleconference meetings on GoToMeeting, Zoom, or the like, and I LOVE using one ear at a time so I can keep an ear open to the world around me and not having a dangling earbud bouncing around. 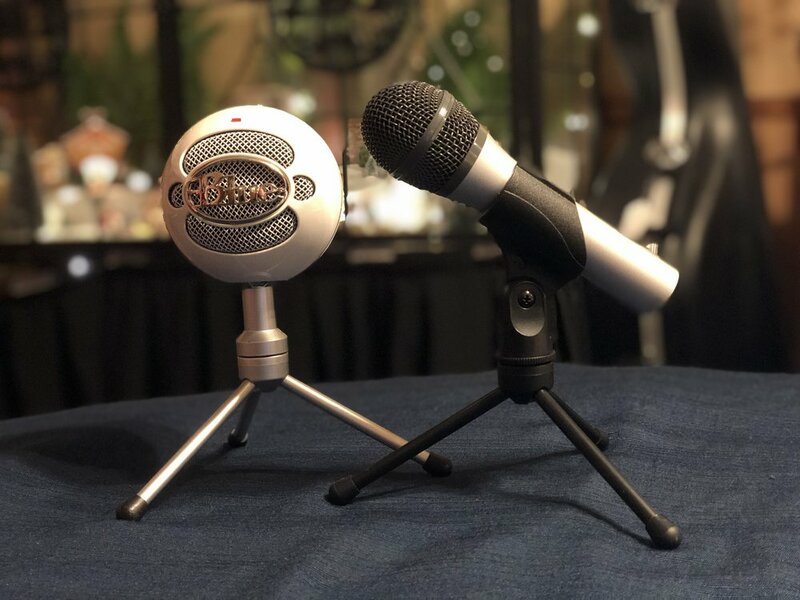 Well, today I sit down to get more familiar with my new Audio-Technica ATR2100 microphone, which I love so far, and I had to find the time machine to go back and find a wired set of headphones to plug into the mic to use as a monitoring option. I wanted to try the wired option in contrast with using the AirPods as a monitor, so the wired headphones will most likely not be a final decision, but seeing that tangled clump of wires made me once again appreciate the insistence of Apple to loose something tried and true for something possibly better. Now, while I still have to have extra bits in my car to make it work, it’s something that I can handle with relative ease and since it stays in the car and ends up being a single connection to the phone, it’s not a terribly inconvenient option until I get something with CarPlay.